Raising funds for your political campaign requires finesse and a good solid donation platform. Make it easy and follow campaign finance laws with Give. Have you thrown your hat into the ring? 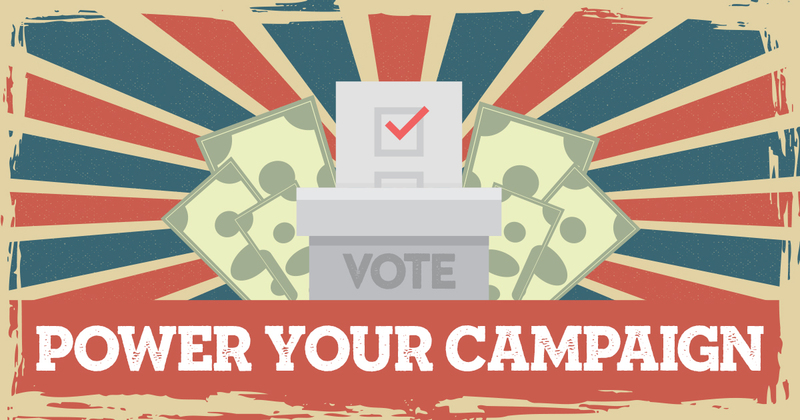 Are you working on a political campaign for a local politician or candidate? Then you know that getting contributions to your campaign is challenging. Reaching contributors and making them reach for their wallets while also making sure that you are complying with campaign finance laws is not easy. Our own Michelle Ames, Head of Customer Success for Give, is running for office in her New York county. Here she shares how Give can help your campaign like it’s helping hers. If you build it, they will come. Right? Well, not always. You can create an amazing website, but still have no visitors (and therefore no contributions). It isn’t enough to create something wonderful; you need to tell people it’s there and why it’s important to them. On the internet, we call this creating good content and promoting it with Search Engine Optimization (SEO). Using Give is a great solution for pairing your contributions/donations page with good SEO. Whether you use a Give page or place the Give form shortcode on another page, you can include good content and images with alt-tags and/or captions. These elements are read by search engines like Google, Bing, and Yahoo in order to categorize and index your pages. When someone types in relevant words, the more organized your page is with those keywords included, the easier it is to find. If you use the Give donation page created by your form, you can easily add a featured image when creating the form. Want to add more great content? Use the Give Single Form Sidebar widget space. Here you can add text with your campaign slogan and platform promises. Tell them why their dollars matter. What will you do if elected and why should they help get you there? You can also add image widgets, providing strong motivation for financial support for your campaign. Some great image ideas include kissing babies, shaking hands, public speaking, and smiling with your future constituents. Always include good alt-tags and/or captions on your images. These are great for SEO and another place to show and tell contributors why you’re the right person for the job. If you’re placing the Give form shortcode on a page within your site instead of using the page generated with your form, then the same rules apply. Always include good content and images with descriptive alt-tags/captions. The difference is that on a regular WordPress page, you won’t use the Give Single Form Sidebar widget. This kind of page will inherit whatever style you’ve created as your page template. If you’re using page builders, the page will appear as you style it. The page’s featured image will also be the featured image on your donation page, not the one in your Give form settings. Combined with a reputable SEO plugin and good keyword research, Give will do the heavy lifting to collect campaign contributions once donors arrive at your site. All you need to worry about is setting it up and making sure your forms are compliant with campaign finance laws. There are many rules and regulations that you need to follow to accept campaign contributions. This article speaks generally of US Campaign Finance Laws, so please be sure to follow any specific requirements in your jurisdiction. Give’s Terms and Conditions and the Give Form Field Manager add-on can help you ensure that any contributions made to your campaign are eligible for receipt. The first step to making sure you’re compliant with campaign finance laws is setting your terms and conditions. We recommend using the global settings in Give, so that any forms you create are consistent. To do this, go to your dashboard then Donations>Settings>Display Options>Terms and Conditions. Make sure you click “enabled” and then type up the terms and conditions your contributors need to agree to in order to donate to your campaign. Not sure what to include? Start with the basics as outlined by the Federal Election Commission. State them as first-person statements that your donors can agree to. We will not compensate, whether through commissions, finders’ fees, or other means, any third party for directing a gift or a donor to this campaign. Certain other gifts, real property, personal property, in-kind gifts, non-liquid securities, and contributions whose sources are not transparent or whose use is restricted in some manner, must be reviewed prior to acceptance due to the special obligations raised or liabilities they may pose for the campaign. We will accept donations of cash or publicly traded securities. Gifts of in-kind services will be accepted at the discretion of the campaign. Make sure you note in more than one place that contributions made to a campaign are not tax deductible. This is why we often refer to them as “contributions” instead of “donations.” You never want to mislead a donor who may give a large contribution expecting a tax donation only to be surprised at tax time to learn there was no tax benefit to their contribution. On your Give form under the “Terms and Conditions” tab, click “Global Option” and your form will display a checkbox for the donor to agree to the terms and conditions. This section also includes a link to toggle the terms and conditions open and closed for the donor to read. In addition to the Terms and Conditions requirements, campaign finance laws in many jurisdictions require that contributors list their job title and employer. This is where Give’s Form Field Manager comes into play. You can add a checkbox for a donor to click if they are retired or not employed followed by fields for occupation and employer for those who are employed. With Give’s setup capabilities, you can have those fields side by side. This way, there is no need to stack them making the form appear even longer. 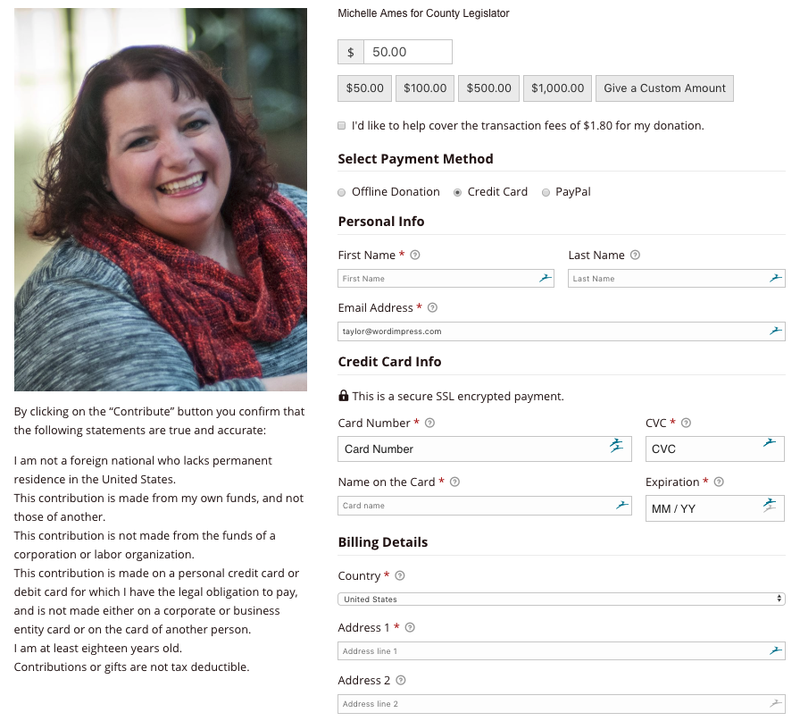 Other required information (like the donor’s address) can be captured through the contributor’s payment method. To make sure you collect this information, enable the collecting of billing details under Settings>Gateway then the particular gateway you’re using (PayPal, Stripe, etc.). Make sure you can send your newsletters to your donors by using one of Give’s email marketing add-ons to allow your donors to opt-in and get added to your lists in MailChimp, AWeber, or Constant Contact. Enter all of your offline donations into your donor database by using the Manual Donations add-on. Keep all of your contributor information in one place this way. Use Give’s Fee Recovery Add-on and allow your contributors to be even more generous and cover the transaction processing fees for you. Keep your supporters on your website by using payment gateways that don’t require them to leave your site to complete their donation. Of course, the easiest way to get all the power of Give for the best price is with the Plus Bundle, giving you access to every add-on Give has. Put Give to work for you and your campaign team so you can focus on meeting and persuading voters. Let your website collect your contributions while you focus on your campaign. Now that’s a vote of confidence we can get behind.